Size: 15 or 20 yard containers. Price include 5 days rental. Roll off dumpsters for clean concrete are used for various clean-out jobs. Most municipalities have Roll off dumpsters trucks for their Waste Services. Roll off dumpsters are easy to install, maintain and use for waste disposal. Their mobility is their main property appreciated by users. The loaded containers are emptied at work locations, cleaned and disinfected for future use. 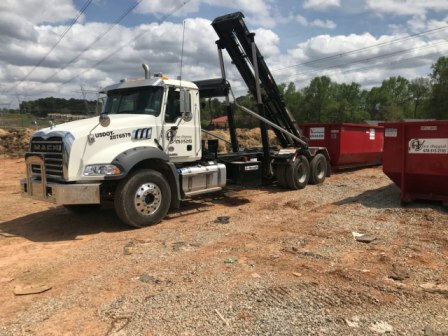 The roll off dumpsters rental are the most highly demanded containers especially in household areas for waste collection. All kinds of waste management services for roll off dumpsters are efficiently and carefully handled by Vine Disposal. Everything is handled by the waste management services workers - from giving guidelines for waste services, getting installation permit, pick-up, collection of debris, transportation to sorting for recycling, keeping hazardous material from affecting lives and complete disposal of trash. The waste services plan out the activities and schedule their trash pickup and container delivery. The provided customer service for roll off dumpsters is friendly, cooperative and immediate. Vine Disposal services are affordable at low prices and even give off discounts.